Thanks to the MonsterTackle.co.uk homepage for reminding me that Savage Gear have released an awesome new colour for their soft plastic sandeels. 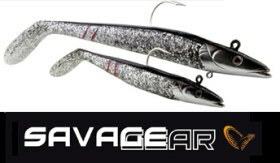 For 2012, the Savage Gear Sandeel is available in Dirty Silver for the first time. This great new colour has all the merits of a surefire hit; contrasting top and bottom, realistic sparkle and flash & the inclusion of red slash marks - a great strike trigger for predatory fish. The Savage Gear Sandeels in Dirty Silver are arguably the coolest of the mainstream sandeel imitations available on the UK market today. I really think these lures will give the already popular Sidewinders some competition this year. As usual the Dirty Silver version features the same quality, hand-poured material and build, in a very realistic sandeel profile and action.